White Fragility is an excellent primer on how white people can help in dismantling structural racism. And in doing so relieve the suffering of people of color and make our society just and equal. Many people of color suffer when trying to explain to white people how the structures of racism work or how what the white person just said, intended or not, has a painful impact. Her thesis is that if white people could get an understanding of how they inadvertently contribute to structural racism, people of color will experience relief. 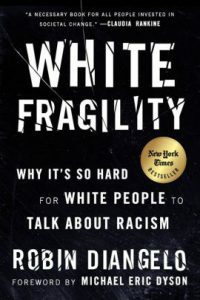 White fragility refers to the situation when a person of color points out a racist statement, white people, who see themselves as good people and non-racist, almost always defend what they said or did rather than taking in the education they just received. This shuts down any further discussion of the impact and shuts down the person of color who is in pain. This makes the possibility of dismantling these structures impossible.